What is a hedge fund? And what does it mean to hedge your bets? Hedge funds are companies which pool capital from wealthy clients with a view to maximising return. They invest in all asset classes - bonds, equities etc - and because of the scale of their investments can profit from small price movements. The largest hedge funds are also 'market makers' - their investment decisions influence others. 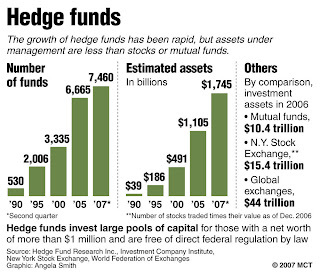 The verb "to hedge" means to "insure oneself against loss but some successful hedge fund managers have been very aggressive in their investment strategies. The credit-default swaps market (famously described by Warren Buffett as 'weapons of mass financial destruction') is an example of this. In general English 'hedging your bets' is to approach an uncertain situation by taking action to cover a variety of outcomes. When a bookmaker receives a large bet on a particular result, he will generally 'lay off' the bet with another bookmaker. This mean by betting a smaller amount on the opposite outcome. That way he limits potential losses. In politics a company might hedge the result of a closely fought election by making donations to both competing political parties. The phrase 'hedging one's bets' can be traced back to the 1670s but surprisingly did not enter the Oxford English Dictionary until 2011.